A galvanic cell is an electrochemical cell that produces electrical energy via spontaneous redox reactions; reactions that involve strong oxidants and strong reductants. As such, a galvanic cell is also commonly referred to as a discharging battery where chemical energy is being converted into electrical energy. Individual cells in which conjugate redox pairs are present. When oxidation occurs in one half cell, reduction occurs in another. 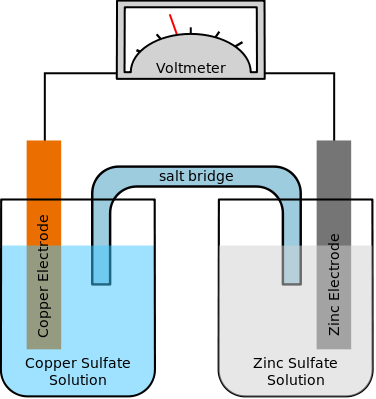 The typical set up of half cells is to have one of the conjugate redox pairs to be the metal electrode and the other should be in the solution the electrode is submerged in. 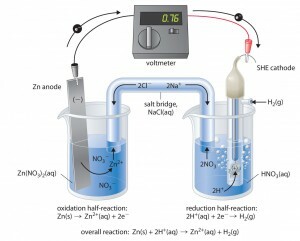 Other configurations include having an inert electrode such as platinum and having the conjugate redox species to be in solution together and having a glass tube surrounding the inert electrode to allow the reactant to be introduced if it were a gas like H2(g). Contains ions that balance the charges formed from each half cell. It is important to show which directions the cations/anions of the salt bridge moves to show the completion of the entire circuit. Cations move towards the cathode whereas anions move towards the anode. Used to connect the two electrode from each half cell. The movement of electrons from one electrode to the other creates electrical energy.